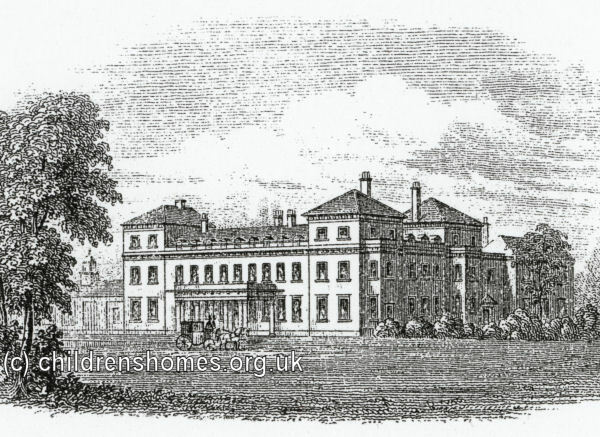 The Sandwell Hall Training Home was founded in 1857 "to receive children, more especially the orphans of the respectable poor, and train them for domestic service." The Home and occupied premises at Sandwell Hall, near West Bromwich. The property was owned by the Earl and Countess of Dartmouth, who were also Presidents of the charity. The Home initially received just girls but by 1862, additional facilities had been established including a boys' industrial school, a home for governesses between situations, and a sanatorium. Plans were also being instituted for a residential school with modest fees for the children of clergymen, which would also provide a day school for the children of tradesmen, farmers etc. in the neighbourhood. Children admitted to the Training Home were normally aged 12 or over and to provided a certificates of good conduct from the master or mistress of the school they had last attended. No children afflicted with any infectious disease, bodily infirmity, or subject to fits, could be be received, and a medical certificate to this effect was required. A payment was required for each child of 6s. a week, for orphans and girls; above the age of 12, 5s. ; girls above 15, 2s. 6d. a week. Girls above 16 of good character (preferably members of the Girls' Friendly Society) were admitted free to be trained at the Hall for twelve months. Those who required to learn dressmaking were required to pay a premium of £3. An entrance fee of £1 for costume was required for every child. No girl or boy entering under 13 could be removed before the expiration of two years from the time of admission, without the consent of the Managers of the institution. A subscriber of £10 annually had the privilege of always having one child in the Home. One of the difficulties usually felt in training establishments, is to give the same sort of work as will afterwards be required in domestic service. But here this is obviated; the rooms are spacious; carved woodwork and pretty things must be dusted; and the young girls, under a careful housemaid, are accustomed to this and all kinds of housework. The kitchen girls again, take it in turn to learn cooking, to do scullery and dairy work, and to clean their bedrooms, the refectory, and the various apartments in use on the ground floor. These are under the superintendence of a lady cook, an Associate of South Kensington. (A school of cookery, is also opened for the ladies of the upper department, and others from the neighbourhood.) The table-maids learn to clean glass, etc., under a good servant, and wait at table, with alacrity and evident pleasure. Then there are laundry and wash-house fitted up with every convenience, with a hot room for drying, &c., and here laundry work can be most successfully taught. There are boys as well as girls . The former are under careful supervision, and work in the garden, farm, stables, or in carrying the coals chopping the wood, etc., for the large establishment. The children are frequently the orphans of very respectable parents, sent either by their own relations or by some kind, disinterested friend. Some of the younger ones go to a national school in the neighbourhood, whilst all, three times a week, attend the night school in which some of the ladies teach, and on the other evenings there is a sewing school, a singing, or a confirmation class. The whole household assemble twice a day in the chapel within the house for morning and evening prayer, when a portion of the English service is read, and the lady superintendent gives a short catechetical explanation of one of the lessons of the day. In 1898, the site became a branch of Winson Green Asylum, housing 150 inmates variously referred to as "feeble-minded boys" and "harmless lunatics". The premises were later occupied by the Sandwell Hall Industrial School for Mentally Defective Children. Following damage by mining subsidence, the building was demolished in 1928.